There’s a ton of great dim sum places in Toronto and I’m always looking for new places to try. In late November last year , I went to Sky Dragon for the first time and then returned with Michelle for a second visit earlier this month . Sky Dragon is located on the top floor of Dragon City Mall right in the heart of Chinatown, but for some reason, it had never crossed my radar. Perhaps because it’s not at ground level? 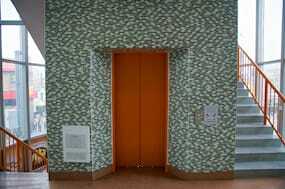 On my first visit I was able to snap a photo of the view from the elevator ride up to the fourth floor, but the elevator was out of service on my second visit so Michelle and I had to take the stairs. 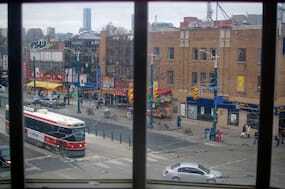 Being on the fourth floor, it’s not that high up, but it still makes for an interesting view of Chinatown. On both visits, Sky Dragon made an excellent first impression. Coincidentally, both visits were at exactly 1pm. (My first visit fell on a Friday, and the second on a Saturday.) The restaurant was very busy and nearly full both times, but I was greeted at the front right away and didn’t have to wait very long for a table. You can see from the photos that in late November they had put up some Christmas ornaments, which got replaced earlier this year with ornaments for Chinese New Year. A subtle touch, but I appreciated the effort nonetheless and it didn’t go unnoticed. On my first visit, I found out upon arriving that all dim sum dishes are only $2 each from 9am to 4pm on weekdays (except holidays), and $2.30 each on weekends from 9am to 11:30am. To most people, that would probably be a pleasant surprise that they wouldn’t have to spend as much as they expected, but to me, it just meant that I could order a lot more dishes (for variety) without breaking the bank. After all, I could always take any leftovers home, no? 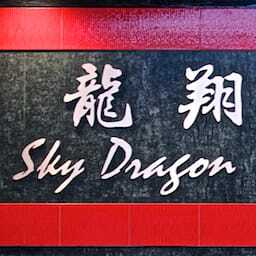 The dim sum at Sky Dragon turned out to be much better than I expected – comparable to Rol San in terms of quality. At $2 each, I had set my expectations very low and wasn’t expecting much, but overall, it turned out to be very respectable dim sum. I was pleasantly surprised. The Shrimp & Chive Dumplings were very flavorful and had a very pleasant taste, but stuck together very easily and were a little too starchy. Still very good though. Chicken Wings at dim sum? Sure, why not!? I’m glad I took some when they came around too – they were very crispy on the outside, but super juicy and tender on the inside. Not dried out nor overly crunchy in the least bit. As for the Siu Mai, they had a much higher ratio of pork to shrimp than I usually like, but even still they were super tasty and had an excellent texture to them. The rice wrapper for the Har Gow was a tad bit too thick for my preference, but the dumplings stayed together really well and the wrapper didn’t fall apart so easily, so it was a fair trade-off. Inside, there was no skimping on the shrimp and they had the perfect hint of sesame in the background. They weren’t stellar Har Gow, but definitely better than the Har Gow at Pearl Harbourfront, and for only a third of the price. My initial sampling of the Deep Fried Squid yielded a very pleasant taste, but the texture was way too tough and you could tell they weren’t very fresh, which I was able to confirm by smelling them. No matter, I was already super full by then anyways. There was no way I was going to finish all of that food by myself, so I did indeed have a lot of left-overs, as I expected. It was quite a bit of food and my total bill including tax (but before tip) came to a whopping $16.50. Beef balls, spare ribs, shrimp & chive dumplings, deep fried chicken wings, siu mai, har gow, and deep fried squid – it probably could have fed two people, and all for only $16.50. Not bad. On my second visit to Sky Dragon earlier this month, Michelle and I went on a Saturday and missed the 11:30am cut-off for $2.30 dim sum, but I was curious to see what other items, if any, Sky Dragon would bring out while the prices were higher. And indeed, they did bring out a lot more special items in addition to the regular dim sum staples. Some parts of the Beef Tripe were a little chewy, but not overly-so. I also thought it needed more ginger and could have been a lot spicier, but it was still very good tripe nonetheless. The Beef Ribs were much sweeter than I’ve ever had before and not overly garlicky nor saturated in pepper like I’m used to. Nice. Similarly, the mussels were excellent and I remember saying to Michelle, "that’s what those are supposed to taste like!" These mussels were super delicious and there’s just no comparison with the mussels you get at Chinese buffets – not even close. Eating beyond the point of being satisfied, like I always do at dim sum, I was on my way to getting full (and Michelle was already there) when we saw these Stuffed Crab Claws come out. I had tried these before at Tremendous in Mississauga but they were very old and smelly unfortunately, so I was curious to try them again, this time at Sky Dragon. I was glad I did – though I did find them a tiny bit bland, they were very delicious and worth the extra glutting. On both visits, Sky Dragon was full, mostly with Asian patrons – a good sign perhaps? 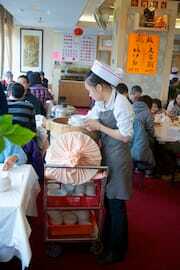 The downside, of course, is that the dim sum ladies spoke very little English, but they did try very hard to communicate as friendly and respectfully as possible, so it wasn’t a huge barrier by any means. I also couldn’t help but notice that all the signs on the walls, (perhaps advertising specials? ), were all written in Chinese with no English translations. It didn’t bother me, but it was very clear that Chinese patrons make up an overwhelming majority at Sky Dragon. Again, for someone who prefers authenticity, that’s a good thing. The service at Sky Dragon was on-par with what you’d expect from a busy dim sum restaurant of this size. They were efficient at clearing the empty steamers off the table so crowding was never an issue. If I’m being super critical, my only complaint would be that on my second visit, even though we were seated right away and didn’t have to wait long for a table, we did have to wait a little too long for the carts to start coming out. It took eleven minutes from the time we were seated before we could start eating and had I been alone it probably would have been more of an issue, but in good company with lots to talk about, it wasn’t so bad. My first impression of Sky Dragon, as I mentioned, was a good one, and I definitely appreciated the extra effort they took in decorating the place for the season, be it Christmas or Chinese New Year. But after having a better look on my second visit, I did notice that the restaurant is a little run down and could use a fresh coat of paint here and there. Nothing major though, and for the most part, they’re doing a decent job of keeping things in good shape, which is definitely a challenge for a restaurant of this size, that gets this busy. And for what it’s worth, the bathrooms were super clean and presentable – easily above-average compared to most restaurants in Chinatown. Overall, I was pleasantly surprised after my first visit to Sky Dragon – it was a positive experience that deserved a repeat visit. The $2 price definitely lowered my expectations substantially, but it turned out to be very respectable dim sum, with some dishes even surpassing the quality you get elsewhere at thrice the price. And after my second visit, I’m looking forward to making many more visits to Sky Dragon in the near future. Sky Dragon Chinese Restaurant was published on Wednesday, January 30, 2013 at 8:01pm EST by Daniel Menjívar and last updated on April 11, 2018 at 9:30pm UTC .